Give her a bottle. Burp her. Then, while she's still smiling, take off her clothes, change her diaper, put on the oh-so-cute clothes you have picked out for that perfect picture with Santa, cram her feet into those precious little shoes you love and she hates, grab the hair accessory to add just before the camera flashes, strap her into her carseat, grab the keys and your wallet, bolt out the door, snap her carseat into the car, drive like a madwoman to the mall (all the way making silly faces and noises to keep her smiling), jump out of the car at the mall, snap her into the stroller, run through the mall like a crazed lunatic (praying there won't be a line to see Santa; don't forget the silly faces and noises), dash into your place in the line (you knew all along there really would be one) and wait calmly for your turn. 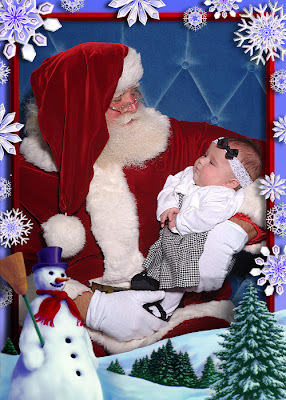 Then, place your baby onto Santa's lap. Oh no...the smile is gone. So, you settle for the picture of your expressionless baby thinking, "Okay, this old man can hold me, but I absolutely, positively will not smile no matter how many times that goofy man waves that Barney doll in front of my face." This picture is priceless. She looks so smart and pretty!